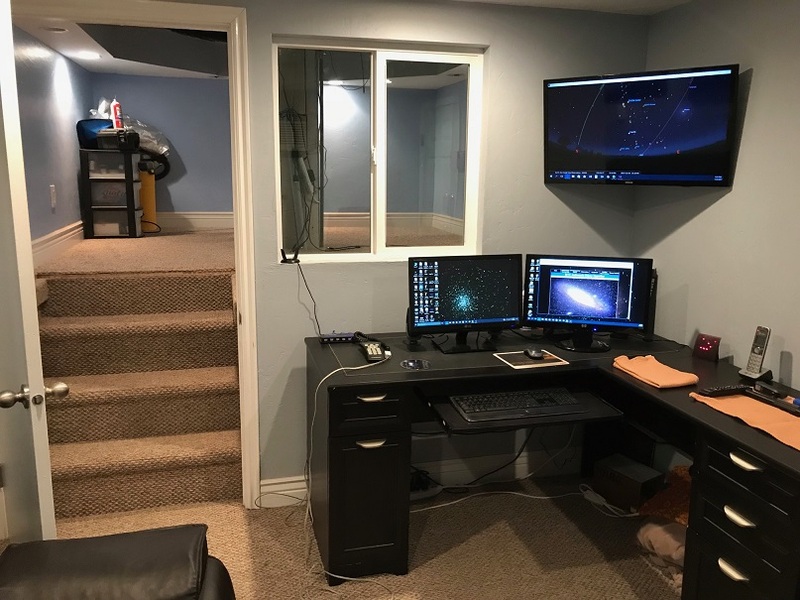 After setting up and tearing down the scope every time I wanted to view the heavens, it became apparent that a permanent home for the scope was needed. I initially settled in on a "Roll off Roof design as I wanted to see the entire sky while viewing. Domes needed to be custom built or were way too expensive. My son again influenced me and said, "Get a Dome". I started researching and too my surprise, there were some manufacturers that provided Domes at a reasonable price. I settled in on Explora-Dome as they were the correct size, right price and good quality. I got my information on the Explora-Dome at their web site Explora-Dome by Polydome. 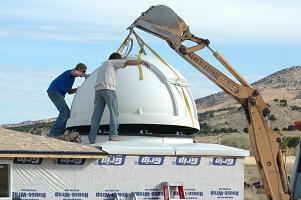 I purchased the Dome through one of their dealers Stellar Vision & Astronomy Science Store in Arizona. 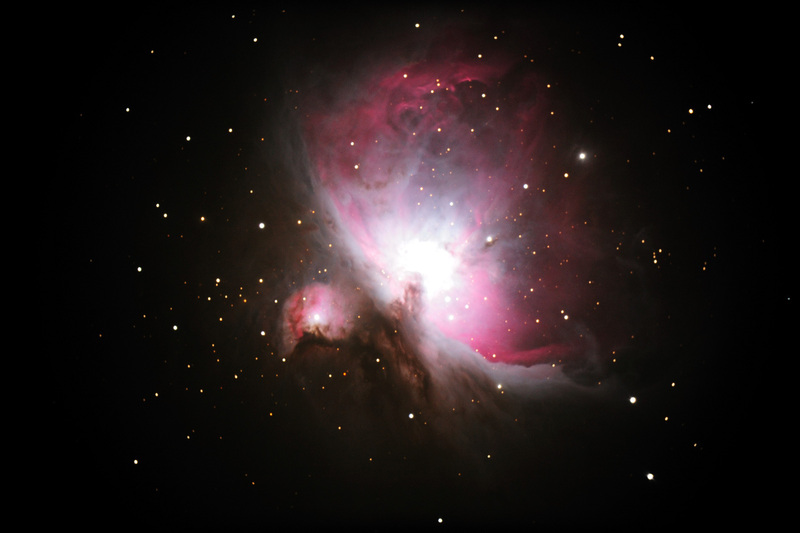 I viewed many designs by looking at Dome Observatories at the web site Amateur Astronomical Observatories. This time my wife influenced my decision. Without her, this project would not have been possible. She was supportive all the way and her only request was make it match the house, add a shed for garden tools, and finish the inside. In other words, make it nice. 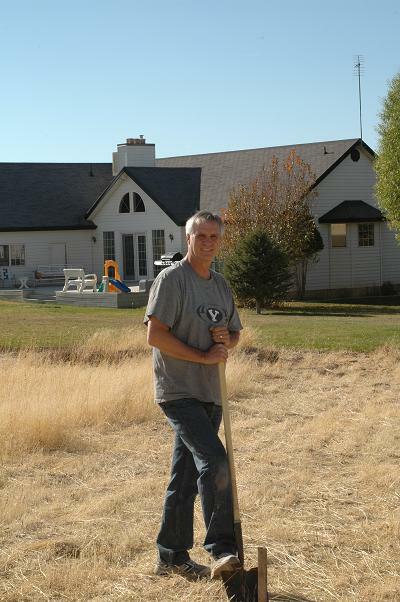 I hired a local contractor, and the construction process began. 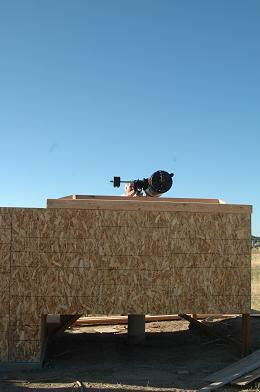 The dimensions of the “Scope Room are 10’ X 10’ X 4.5’to match the Expora-Dome roof support design. The “Warm Room” is 10’ X 12” X 7’. We added a “Shed” with a roll up door for housing lawn mowers and garden tools. 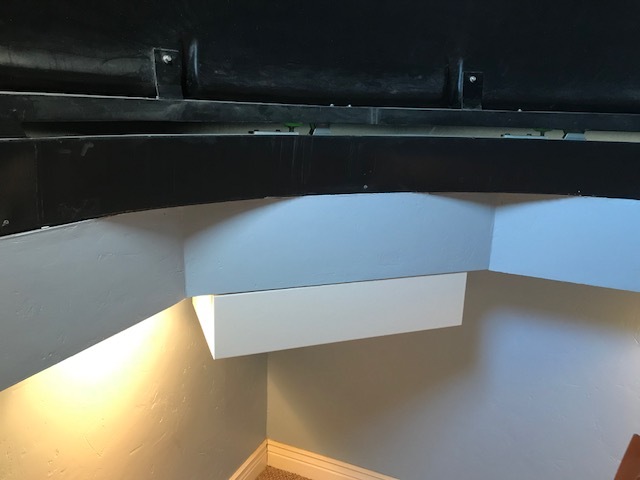 The photos below are provided to show the construction sequence of the Dry Creek View Amateur Observatory. To see larger photos, click on the image. After viewing the larger image, click the the back arrow in your browser to return to the web site. I elected to go with 2x4 construction and plywood inner siding. I know this is more expensive, but I wanted a quality observatory. This allowed for insulating the "Warm Room" for those cold/hot nights. It is relatively easy to warm and cool the warm room. The picture on the left shows the view from the warm room to the scope room. I used threeway switches for Red Lights and White Lights. The lights in both rooms can be controlled from either location. 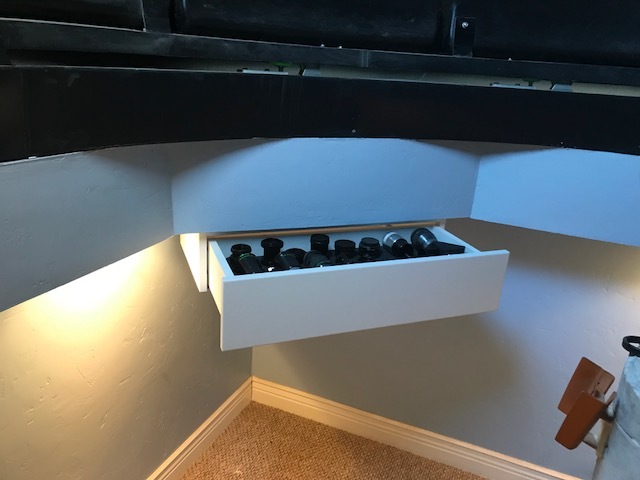 I don't have wiring pictures, but I placed 120 V outlets on all four walls 12 inches from the floor and one higher up on the east wall of the scope room. I am hoping someday to automate the dome and I wanted power closer to the dome. I ran a 2 inch conduit from the pier to the warm room for connecting to computer control. Up the south side of the pier, I placed another 120 V surge protected outlet to run the scope electronics and cameras. 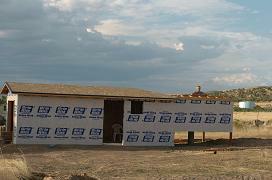 The entire building was wrapped with a vapor barrier before putting on the final siding. The picture on the right shows another addition requested by my wife. 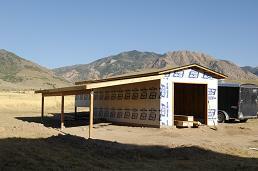 The roof was extended to allow for deck furniture and other items to be stored under a roof during the winter months. The Explora Dome Roof Support assembly is shown in this picture. The plans for this support structure can be found by clicking this link explora-dome.com for the "Wood Building Lay Out" instructions. The dome roof support sits on the walls and provides the foundation for the dome. 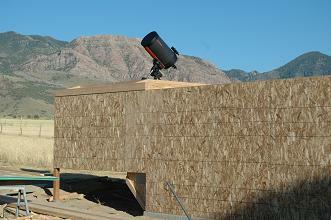 The pier height was calculated to allow for horizon viewing when the scope is in the lowest position as shown on the left photo. When in the default position the scope is shown on the right photo. 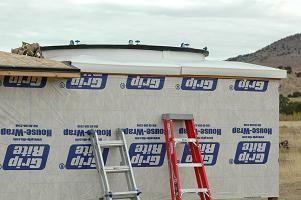 I purchased the fiberglass roof structure to fit on the roof support shown in the previous slides. These came in four pieces provided by Explora-Dome. The dome ring and rollers as shown were provided with the purchase of the dome. In the photo on the right, the Back Hoe had just enough reach to set the dome on the rollers. After the dome was set, the dome retainer ring was installed. The white siding was put on the sides of the observatory, rain gutters were installed and the outside was finished as shown in the beginning photo. 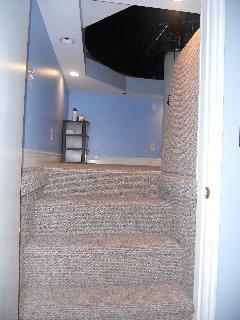 The warm room was sheet-rocked, textured, painted, and carpeted. 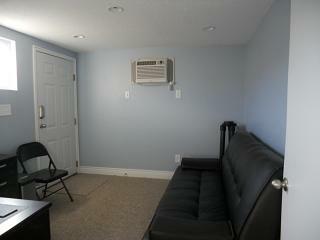 This 12x10 foot room is just the right size to fit a couch, computer desk and a few chairs. The room is heated with a wall insert 120 V heater that is thermostatically controlled. There is 1 Red light in the center of the room and 4 white lights. I chose "Can Lights" so that fixtures will not be hanging from the ceiling. 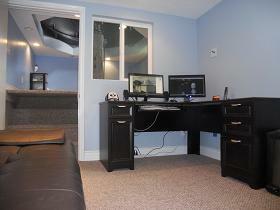 Below are some pictures of the finished "Warm Room"
I recently added a new 32 inch monitor to the Warm Room. I now have three monitors to work with. The purpose of the 32 inch monitor is to give a larger viewing screen when people come over to the observatory. When doing astrophotography, I use it to put a large image of Stellarium on the monitor to see what my photo target is located in space. The scope room is not insulated and not heated. I had it carpeted just like the warm room so that if I accidentally dropped an Eyepiece or other piece of equipment, it would have a soft landing. 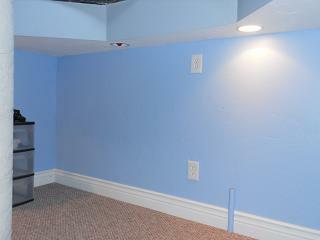 The sheet-rock gives this room a finished look and a nice place to work. Again I used "Can Lights" for lighting. There is one White light on each of the 4 sides giving a total of 4 white lights. There is also one red light on each of the 4 sides giving a total of 4 red lights. All lights can be controlled either from the Warm Room or the Scope Room. 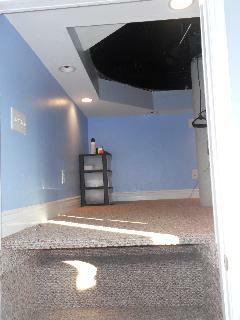 I had a "Trap Door" carpeted and installed over the steps leading up to the scope room. You must watch your head entering or leaving the scope room, but once inside you can completely stand up. The dome is 8 feet in diameter and has a height of over 4 feet. You can comfortably have 4 people at one time in the scope room. 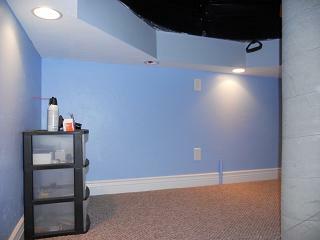 Below are pictures of the scope room. Trap Door open and Closed. 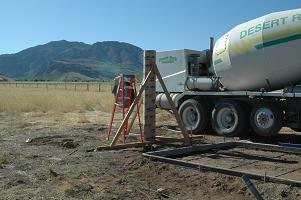 The Dry Creek View Observatory was officially finished on September 3, 2011 when the concrete was placed for the sidewalks and patio. It took a little over 1 year to build. It could have been finished in months, but the contractor worked on this in his spare time. 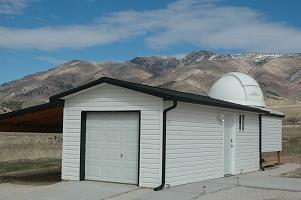 The entire cost of building the Observatory including cement work, finish work, furnishings and dome was approximately $14,000. Sounds like allot but spreading out the costs over a year made it less painful. 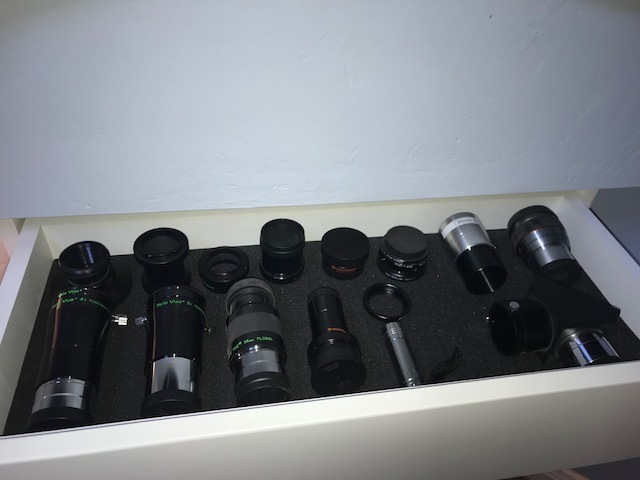 To keep the clutter down and to make a more organized scope room, I added a drawer to house my lenses and visual observing equipment. Pictures of the drawer loaded with my lenses are shown below. Why did I purchase a dome instead of a roll off roof design? The dome costs more, and you cannot see the entire sky at a given time. My son said the dome looks neat and it is more what you expect an observatory to look like. That reason alone was not why I purchased the dome. I first determined what I really wanted to do with my scope. I wanted to take pictures. I live in an area near the mouth of a canyon and we get East winds almost every night in the summer. With a dome, I am sheltered from the winds and that makes the scope more stable. I am also not affected by lights from the surrounding houses. For these reasons I chose the dome. I like roll off roofs, but the dome provided me with more protection. The major thing I would do differently is to insulate the scope room. I didn't want to insulate it, because the scope needed to be at ambient temperature. I have found that when the dome is open, the temperature comes into equilibrium quite quickly. I do not see an advantage of not insulating the scope room. 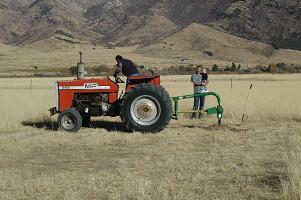 It will help with the summer hot temperatures and winter cold temperatures. I definitely would insulate the floor. Since it is off the ground, it gets cold on the feet. If possible, I would put electric heating on the floor for the sake of the toes on cold winter nights. Because I take my shoes off in the scope room, I presently stand on a heating pad when it is cold.